Subaru has confirmed a series of modifications and upgrades to the interior and chassis of its XV compact crossover. Featuring what Subaru describes as 'the lowest centre of gravity in the compact crossover class - and the highest ground clearance', changes to the car's suspension have been designed to result in a smoother, more compliant ride but without sacrificing stability. Among the changes to the upgraded and revised interior includes improved materials a well as an all-new touchscreen infotainment and navigation system. Subaru describes the interior as featuring a 'higher-quality' look and feel with the adoption of an all new instrument binnacle and new metallic and piano black accents throughout the cabin for the central console, dashboard and steering wheel switchgear. The new 7.0-inch touchscreen display allows smartphone-style control over the advanced navigation and infotainment features, with a swipe and pinch control function for map displays. The driver's LCD instrument binnacle has been completely redesigned and features more upmarket, contemporary blue dials with new graphics. The infotainment display echoes the new blue glow of the driver's instrument binnacle and also now houses a standard-fit rear view camera, offering a wide 160-degree field of view behind the car when reversing. Passengers can also now engage with the car's dashboard-top Multi-Function Display (MFD), which provides a range of information including the status of its permanent All-Wheel Drive system, as well as fuel economy and trip information. 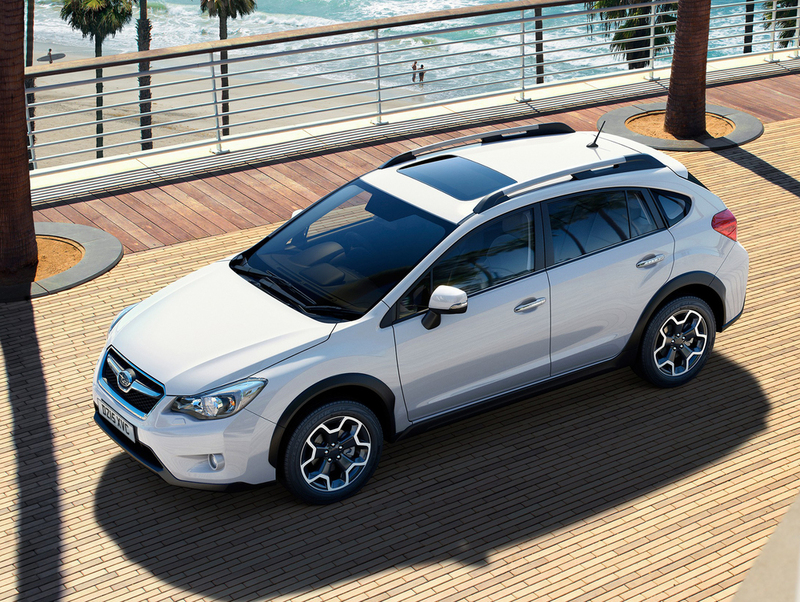 The XV comes as standard with a Symmetrical All-Wheel Drive powertrain and Vehicles Dynamics Control system. For the upgraded model, Subaru says the engineers' key focus was to improve the car's ride quality and reduce the intrusion of noise, vibration and harshness (NVH) into the cabin. For both front and rear suspension, the dampers have had their pitch rate lowered, resulting in a 'smoother and more comfortable ride than earlier models', while reducing roll slightly. The rear suspension features new spring rate settings to further improve stability under cornering by ensuring greater tyre contact with the road, while allowing for greater flexibility in ride over broken road surfaces. Noise from inside the cabin has been reduced thanks to the more widespread application of sound-absorbent material throughout the car, further cutting the intrusion of vibrations and engine, wind and road noise into the cabin. This has been managed with the adoption of new under-bonnet insulators, extra sound-deadening material throughout the floor of the car, and sealing and sound-absorbing materials around the front and rear quarter lights and door lips. In spite of the changes, the upgraded Subaru XV retains its existing on-the-road (OTR) price, with the range starting from £21,995 for the XV 2.0i SE to £25,995 OTR for the range-topping XV 2.0D SE Premium, and goes on sale this month.